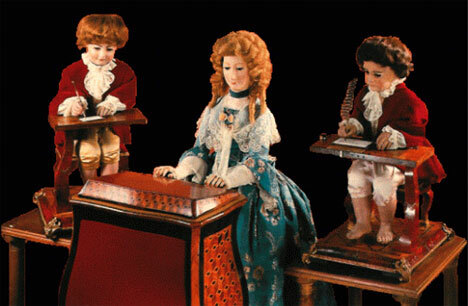 The sophisticated electronic toys in stores today are impressive enough, but the 18th century automata of Pierre Jaquet-Droz are truly amazing. 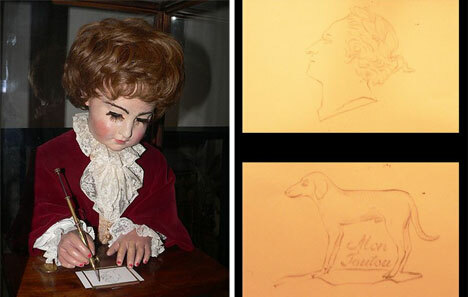 The Musician, The Draughtsman and The Writer are three mechanical dolls built by Jaquet-Droz, his son Henri-Louis and Jean-Frederic Leschot between 1768 and 1774 as advertisements for sophisticated watches. Their mechanisms are shockingly advanced for their time, and today they are thought of as distant ancestors of the modern computer. All three currently reside in the Musée d’Art et d’Histoire of Neuchâtel, in Switzerland. The Writer is the most complex of the trio of mechanical dolls. He writes custom text of up to 40 characters which are programmed one by one using a coding wheel. 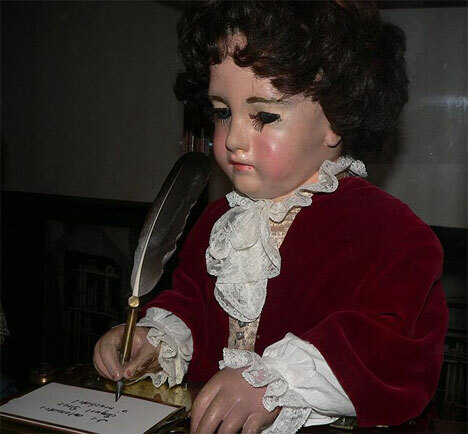 The Writer’s eyes follow the text as he writes and he periodically dips his goose feather quill in ink, then shakes it to prevent drips. The Draughtsman is able to draw four different images using a system of changeable cams. His image library includes Louis XV, a royal couple, Cupid in a butterfly-drawn chariot, and a dog with the words “Mon Toutou” (“My Doggy”). He blows on the pencil periodically to remove accumulated dust. The Musician is a beautiful young girl who plays an organ. 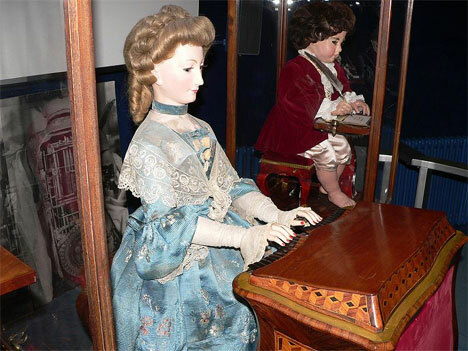 The music is not recorded; rather, it is actually created by the doll’s fingers pressing the keys of her custom-made instrument. Her movements are amazingly realistic, including following her finger movements with her eyes, “breathing,” and balancing her torso as a real piano player would do. See more in History of Tech or under Vintage & Retro. February, 2011.